Aloha! Cluster Pays is a five reel video slot powered by Net Entertainment. 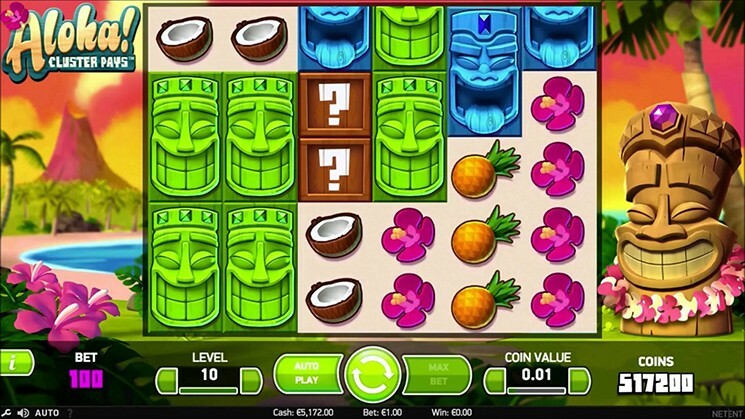 Main theme of the slot is inspired by Hawaii lifestyle with old cartoony feel thrown into it. Main paying symbols are coconuts, pineapples, Hawaiian flowers and multi-colored Tiki masks with additional Scatter and Wilds symbol. Before investing real money players can try Finn and the Swirly Spin Slot for free, or visit any NetEnt casino such as: Royal Panda Casino, Grand Ivy Casino, Spinland Casino and others to play with real money and win. Before you take a flight to Hawaii, bets need to be placed. Value of coin ranges from 0.01 to 0.2 and can be adjusted by using “Coin Value” button. Number of coins per line can be adjusted with “Level” button. Use “Autoplay” to spin the reels automatically and button with two arrows is a “Spin”. 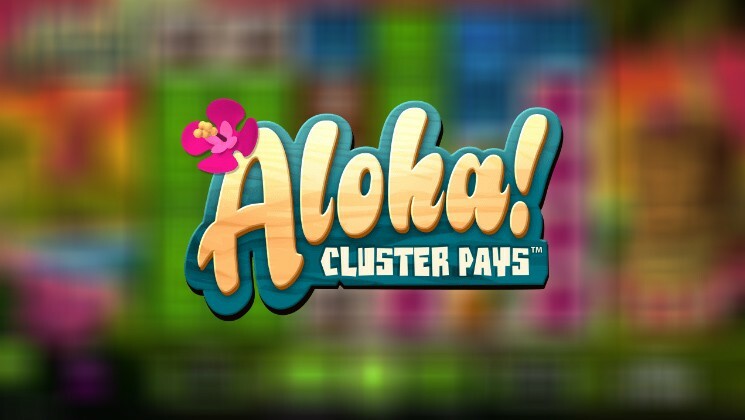 Like others Cluster Pays NetEnt slots, Aloha! also have Cluster pays feature. To win using these feature you need to land 9 or more of the same symbols during whole cluster. Question Mark Crate is a Wilds symbols and it can be used as a substitute for other symbols, except for a Free Spins symbol. Sticky Win Re-Spin feature is activated at random. While this feature is activated, winning symbols stay on reels while other symbols re-spin increasing winning cluster. To trigger Free Spins feature, you need to hit 3 or more letter stamp symbols anywhere on the reels. Number of free spins depends on the number of symbols landed on the reels to activate this feature. Highest amount of free spins players can be awarded is 12. In addition, Free Spins feature can be re-activated during this feature. Aloha! Cluster Pays is a great video slot by NetEnt created to serve all slot enthusiasts and we believe it meets the world class standards for online slots.